OK, you probably know I don’t like ultra-long lens names. I don’t like lenses that are expensive (who does?). So when you throw out a 50mm lens with a long name, like the Sony FE Planar T* 50mm f/1.4 ZA, and price it at $1,500 I’m a bit predisposed not to like it. Seriously, that’s a lot of money for a 50mm f/1.4 lens. Let’s take a quick price comparison of some common 50mm lenses. I say all this just to point out that going into this test my thinking was it had better be really good or I’m going to mock it. For those of you who don’t like to read the articles, I’m not mocking it anymore. This lens is really, really good! This is our usual ‘average of 10 copies, each tested at 4 rotations’ graph. 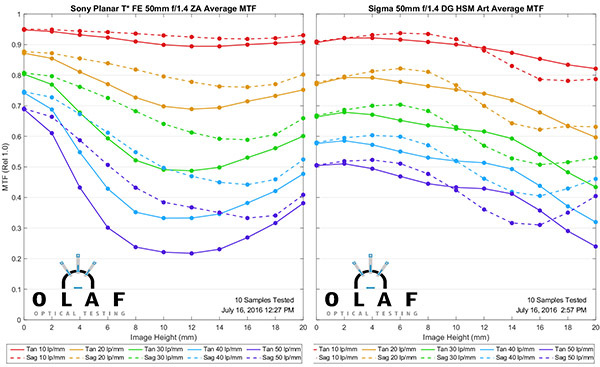 In order to keep the graph sizes reasonably large I’ll do a series of comparisons with the Sony FE 50mm f/1.4 MTF chart on the left, the comparison lens MTF on the right. We’ll start with the one that shut me up, comparing the Sony to the Zeiss 55mm f/1.4 Otus Distagon lens. 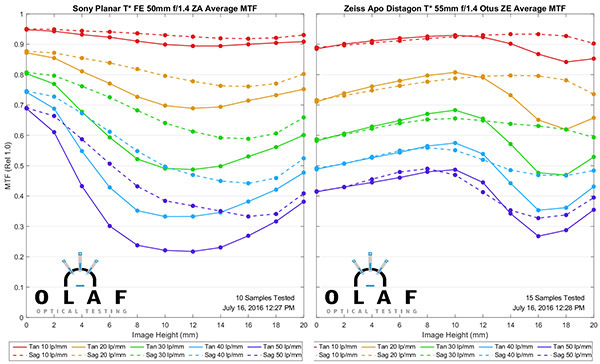 ADDENDUM: The original article contained our original Zeiss MTF curves, done about a year ago. 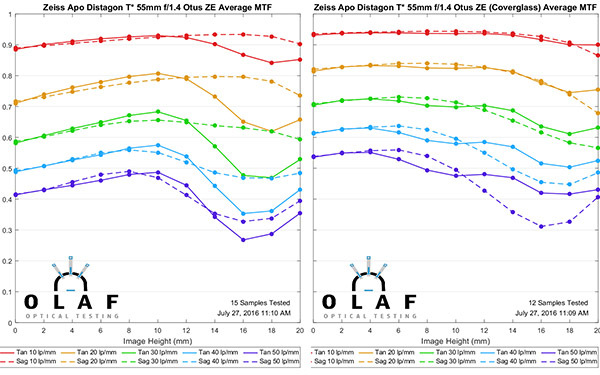 After a polite inquiry and suggestions from Zeiss, we redid the MTF tests for the 55mm Otus and did, as they thought we would, bet better results. Here is the MTF graph showing the difference with new testing methods (on the right), which is, indeed, better than our original methods. This doesn’t change my conclusions that the Sony has a better MTF in the center than the Otus, but does show that the Otus is better in the middle third of the image. I have left all other text and images unchanged and it continues below. The Sony is phenomenally good in the center; just absolutely superb. From a resolution standpoint it is clearly better than the Otus in the center, and just as good as the Otus away from the center as well. There is a little sag of the Sony’s MTF halfway to the center but then improvement out to the edges. One note about that ‘halfway sag’ for both of you who actually read the articles and don’t just look at the graphs. This may be an artifact of sensor cover glass. We are limited to a full mm cover glass increments when testing, so for Sony lenses we use 2mm, which is close, but not exactly the same optical thickness as what covers the sensor. (It’s probably about 0.25 thicker). 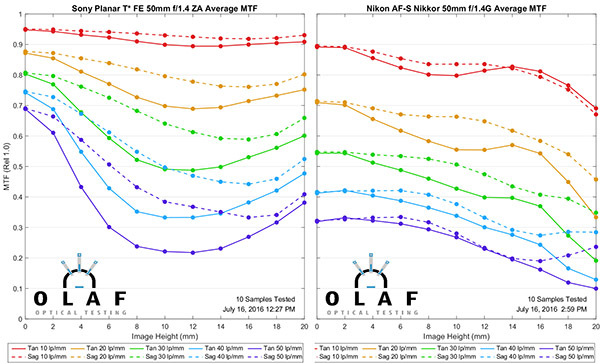 We generally don’t think of a 0.25mm difference as significant for SLRs, but that may not be absolutely true with the short back-focus distance of the FE mount. In other words, the Sony lens may actually be a bit better than what we see here. Or they may not, we aren’t certain yet. Remember for this comparison the aperture difference is significant. The f/1.4 lens has been tested wide open and that half-stop (Actually 2/3 of a stop. It was late. I was tired.) of aperture makes a lens significantly better. The Sony FE 55mm f/1.8 ZA Sonnar is a really good lens, but even giving up a half stop of aperture, the 50mm f/1.4 is better in the center and generally nearly as good away from center. This is most impressive. We’ve evened up the apertures now, with two f/1.4 lenses, comparing the Sony to the Sigma 50mm f/1.4 A1 lens. The Sigma is significantly less expensive and in my mind the best ‘bang for the buck’ among 50mm lenses. The Sigma is really good, and I won’t argue if the Sony is worth the financial difference. But from an MTF standpoint, the Sony is better. This is another unfair comparison, the Nikon 50mm f/1.4 G AF-S costs only a fraction of what the Sony does, but I thought it was a good “what you get for your money” comparison. The Nikon is a very nice, decent quality, usable lens. But the Sony is dramatically better, which at the price it should be. The Sony Planar 50mm f/1.4 is expensive and not everyone needs to plop that much money down for a 50mm lens. But, if you do need one, it’s worth the money; it’s really superb. The center sharpness in particular is unheard of in a 50mm lens. 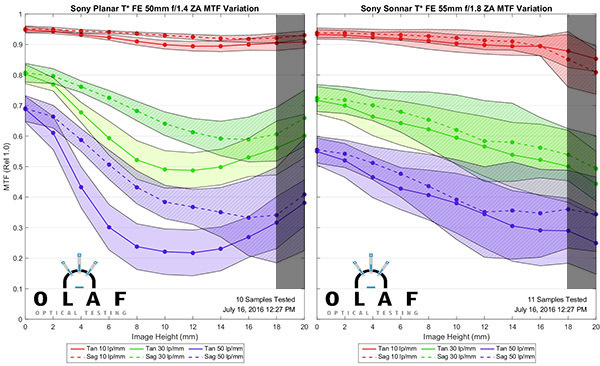 This seems to be a pattern we’re seeing with some of the new Sony lenses, too: The fine resolution (at higher frequencies) is higher than we’re used to seeing. You may have been, like I was, impressed with how well the Sony maintained a high MTF away from center. The optical field helps show why, and it is also very impressive. Both the sagittal and tangential fields are almost perfectly flat from one side to the other. For some photographers that will be more important than absolute sharpness. But for those of you who aren’t aware, a field this flat is really an accomplishment. We rarely see it. There was a time, early in the history of FE lenses, when I used to wince mentally before I pulled up the Variation graphs for a new lens. That time seems to be past, with excellent results from the more recent Sony lenses. So I was looking forward to seeing how the Planar 50mm f/1.4 lens did. I have two things to remind you about. First, remember our variation graphs now show only 1 Standard Deviation, rather than 1.5 that we used months ago. 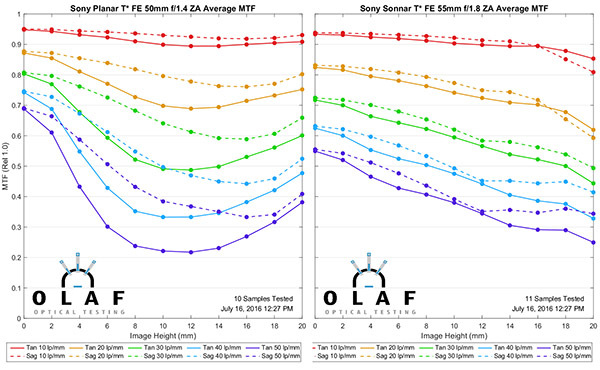 Also remember that our bench cuts off about half of the 20mm (edge) readings on Sony FE lenses, so take the extreme edge variation with a grain of salt. I’ve put a 50% gray box over the questionable area to help clarify this. The first comparison I pulled up was against the Sony 55mm f/1.8 ZA Sonnar, which is one of the better and more popular Sony primes. The new 50mm f/1.4 ZA Planar clearly has less variation than the 55mm f/1.8 did. It’s really nice and consistent. Overall, the Sony FE 50mm f/1.4 Planar has very reasonable sample variation, about what we see in most other high-quality 50mm prime lenses from other manufacturers. MTF tests like this give you a good idea of how sharp the lens might be and how much sample variation you should expect. On the basis of these, the Sony 50mm f/1.4 Planar is as good as anything available. For those of you who need a really high-quality 50mm lens on an FE mount camera, it looks like your best choice. The very flat field with almost no curvature is another plus, and one that may appeal to photographers every bit as much as the excellent MTF does. But of course the proof is in the pictures. We’re starting to see some sample images online and that will explode shortly, giving you a chance to evaluate the bokeh and the lens’ performance in various lighting conditions. But unless those greatly surprise me, I think a lot of people are going to love this lens. 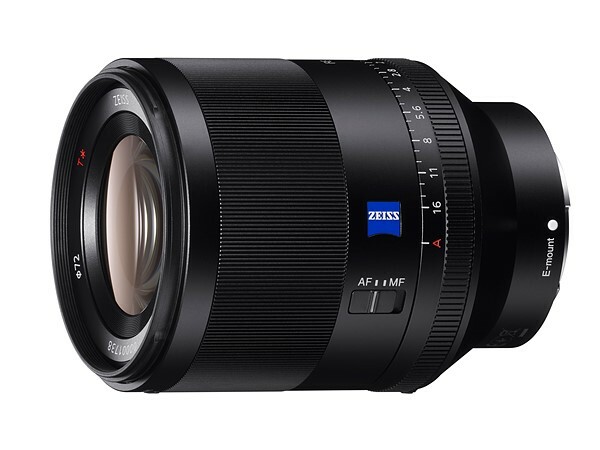 Can anyone explain why Sony FE lenses have extra height compare to other lenses? Is it for edge to edge sharpness or? Since you’re the experts on testing in my opinion. I’ve had three of these and they’ve all been soft on the right side (all from the 06/16 batch). How do you feel evenness is on this lens, I assume you’ve been through a few. I actually thought it was my camera (an a7r2) but it was replaced (six months between manufacturing dates). From what I gather the chances for a tilted sensor on the A7 bodies are slim to none thanks to a very rudimentary design (a good thing). I’ve tried another lens on the body and it was sharp on the right side (a bit soft on the left though). I rented it from LR, then bought one, and it’s not only sharp as heck, it has a certain quality–zeiss. Pop?–that I love. Tom, I’m not the person to ask on that one: I think bokeh and smooth out of focus rendering are so important with a portrait lens, and MTF doesn’t give the whole story there. But I’d consider it, along with the Batis 85 as fast horses in the race. Granted the focal length is narrower for a Sony 85mm G f 1.4, would you purchase this over the 85mm G when it comes to the do all Portrait lens?? • Again, interpolate to calculate the number of these ellipses covering the assumed frame size of this lens. I think it would be a very valuable addition to the curves you publish! Said, it will come. It will most definitely come. How about a teardown @roger_cicala:disqus ? Previously you’ve mentionned when disassembling the 35mm 1.4 that there isn’t much to adjust in the lens assembly if it is decentered. I’m curious to know what Sony did to keep the lens variation on this 50mm lower the its 35mm sibling. Thanks Roger, for taking the time to answer me. Really appreciate it. Frode, that gets a little confusing because MTF50 and MTF10 are really quite different than the MTF in Line pairs/mm graphs. But in this one case, we are concerned that the tangential lines are not as good as they should be because our glass thickness is slightly different than the Sony sensors. On axis, the Sony is amazingly sharp. Off axis it may be a little better or a little worse than the Sigma, which is an excellent lens, but the difference is going to be small. The tangential results for the Sony is lower from 3-4mm compared to the Sigma. The scores just seem relatively low to me, compared to Sigma, at MTF50. The sagittal results appear to even it out from about 6mm at MTF50. I have no clue what sag and tan performance differences would imply for real life. 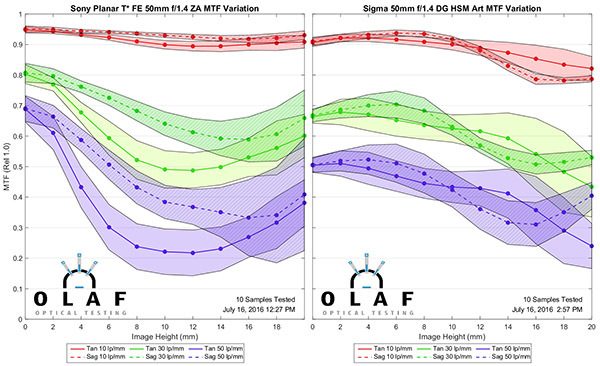 Given that, at MTF50, we have about even results for sag, but close to double the numbers for tan from 6-14mm, does that not translate into the Sigma being more contrasty and even at that, across the frame? The Sony being more contrasty in the very center and the extreme edges? Given the MTF translation post, the Sony should have better resolving power, given its higher MTF10 score? Resolving power seem pretty even across the frame, more so than the Sigma. I also guess that we are comparing a Ferrari with a Lamborghini? They are both great. Really great. Frode, I’m not sure I understand your question. The 30 and 50 lp/mm scores are among the highest 30 and 50 lp/mm scores we’ve tested. The 10 score is sky high, but the 30 and 50 score is lower of center than the other two. How does this translate into my real life results? Agree it is a good compromise. I generally prefer a lens with best midframe performance. If a lens performs well in the midframe region then you can use it for off-centre and rule-of-thirds compositions which allows you to apply rules of space. There are two exceptions for me, the first is for sports/wildlife applications when I would likely frame my subject centrally (where there is AF point coverage) and likely crop in for final use so this would bias me towards centre performance. The other exception is astro-photography, where I’d want good resolution and low astigmatism in the corners when shooting wide open.